New copper gutters are great for coastal areas and any other areas near large bodies of water such as lakes and streams. As copper ages, the protective patina gives it a classic nautical look. Copper offers increased durability over other materials and also longer life compared to aluminum gutters. In many cases, copper rain gutters have been known to last the life of the building as long as they are properly installed and maintained. • Copper has an upscale appearance over aluminum rain gutters. It is usually more decorative in nature than other types of rain gutters. • Copper gutters a well known for their long lasting durability. • Copper gutter components are soldered together thus greatly reducing the possibility of leaking at the joints and downspouts. • One of the disadvantages of using copper is its cost. Copper is more expensive than aluminum. Although copper gutters may be a bit pricey compared to aluminum the benefits and long term life of copper rain gutters more than outweigh the initial upfront cost of installing them. • The installation of copper rain gutter is more involved and takes more time so therefore the installation cost might be higher than other gutter materials. • Patina. For some it’s a CON while for others it might be a PRO. New cooper gutters look great! That’s a PRO. As they age the color changes to more of a nautical look. Some people love the aged patina, others do not. So be sure to compare new cooper with aged so that you can make an informed decision based on your likes. We believe in custom work. That means designing the entire copper rain gutter system according to your needs. Whatever or where ever you want them to fit, we can accept the challenge and fulfill your requirement. Our copper rain gutters are built and customized on the premises after taking accurate measurements. We welcome customers wishing to install gutters on structures with multiple stories. The height of the roof of your house, barn or structure is not a problem for us. Other installers won’t go above a second story roof. We can go as high as you need. Also, we place great attention in designing all the supporting components in your copper rain gutter system so it all looks like one complete unit. The collector boxes, box gutters and leader heads and hangers will all match to give a uniform look to your home and add extra curb appeal as well as superb functionality. Hidden copper hangers keep the gutter intact without disturbing its beauty. 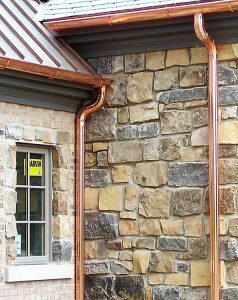 The other materials used in copper gutter systems are end caps, downspout and end tails. Every material has its own specific functions. The end caps make sure that the water funnels through the downspout. The downspout is a part of the gutters that runs vertically down the house. The end tail helps in directing the water in the right direction onto the ground. Now let’s rap about downspouts. If there are not enough of them or they are installed in the wrong places then you’re going to have problems at your foundation. We study your foundation, traffic patterns and walkways and landscaping topography. Then we decide where to best place the downspouts and how many you’ll need for proper water evacuation. Nobody wants the gutters overflowing and we certainly don’t want water pooling on the ground where it’s a hazard or can cause damage to other areas. We do our best to make smart decisions in the placement of all these components. And so we position the downspouts in inconspicuous areas whenever we can. The end tails are aimed in a way that direct water away from your foundation and/or main walkways. 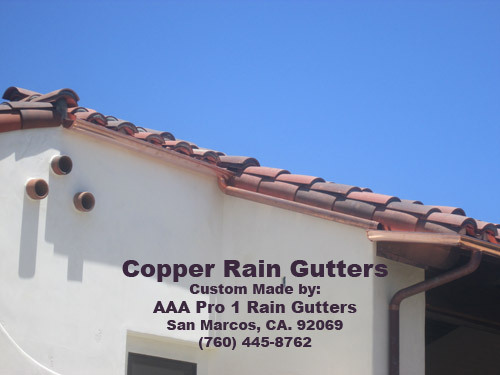 Only professionals should install copper rain gutters. Because any mistake done by unqualified personnel can lead to a severe damage of the expensive gutters on your home. Since copper is famous for its own discoloration property called patina. Some people like this aspect while others do not. Regular polishing can be done to keep that new copper look. If you want the aged patina look then just let it be. Regardless of their external appearance, be sure to keep the insides of the rain gutters clean and free of loose debris. Copper gutters have many great attributes and can greatly enhance the appearance of you home as well as add value for years to come. We are very honest with our work, the satisfaction of our customers and also, we care! There’s no need for you to suffer a water damage loss because of ineffective rain gutters. Call us today for a free quote on any of the following services: Copper rain gutter installation, Rain gutter repairs, rain gutter maintenance, rain gutter cleaning and rain gutter inspections. For personal service, call Greg Martin at (760) 445-8762. We’ll do a free on site quote for you prior to beginning any work. That way you’ll know the price involved upfront. No hidden costs! Simple upfront pricing. So if you are a homeowner, real estate investor or rental unit manager, and you care about the safety of your structures, then call us. We can help you protect your investment in your home or your business. And do it quickly, cost effectively and with a smile! Trust AAA Pro 1 Rain Gutters for superior service and installation of a wide range of quality rain gutter products and services. Services Areas: Serving all North San Diego County and surrounding areas. Serving all North San Diego County and surrounding areas.